This review is going to be a bit different from my usual style because I was lucky enough to get an email interview with the author! 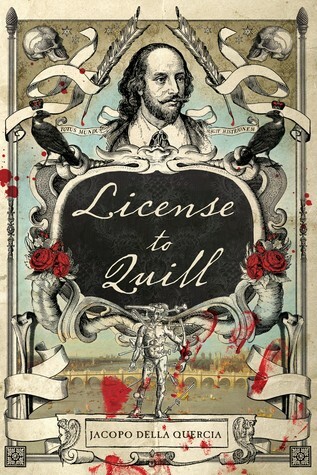 Below you will find his answers to some of the pressing questions I had after reading License to Quill. 1) What inspired you to reimagine the Gunpowder Plot in this way? After finishing my previous book The Great Abraham Lincoln Pocket Watch Conspiracy, I went to work looking for another time period where many events took place at the same time. After learning that Shakespeare wrote Macbeth around the same time as the Gunpowder Plot and likely referenced it in his play, it made me want to dig deeper into the Jacobean period. Sure enough, I learned Protestant England had just entered into a cold war with Catholic Europe, the British government more closely resembled a police state, and there were spies everywhere–among them, the great Christopher Marlowe. It was all the workings I needed for writing a James Bond-esque spy novel with Shakespeare in the center of the story and with Guy Fawkes as one of his primary antagonists. 2) Was there really a street called Muggle in London at that time? Haha! Yes, there was! I’ve also seen it written as “Monkwell,” but “Muggle” is how it appeared on maps from the era. Finding little details like these were some of the most rewarding aspects of researching this novel. I think we can all agree it’s adorable to know Shakespeare grew up on Muggle Street–and believe me, Shakespeare is very much a muggle in License to Quill! 3) Did you enjoy reading Shakespeare and other plays while in school? I did, but Macbeth always stood out to me the most. My elementary school performed Macbeth in Sixth Grade–something I mention in this book’s acknowledgements–but as I grew older, I learned there was so much more to the play that had been omitted from our abridged performance. The play became a sort of Rubik’s Cube to me: a puzzle begging to be solved. I’m not saying I “solved” the play or made any groundbreaking discoveries, but it was my intent to preserve this mystery of the play in License to Quill, where I depict its inception. 4) Which character did you enjoy writing more, Shakespeare or Marlowe? Marlowe was easier for me to write if only because he was dead, which freed me to do whatever I wanted to him as a character. However, I enjoyed the challenge of taking Shakespeare out of his element and throwing him into the world of espionage, complete with gadgets, fancy cars–or in this case, the world’s greatest horses–deadly adversaries, and secret meetings of global consequences. Also, Shakespeare’s story features Bianca, whom I based on the mysterious figure from Shakespeare’s sonnets: the Dark Lady. It was a pleasure to breath life into her and to tell the stories of so many different women from Early Modern England through her. 5) What is your favorite scene in the book? Alas, I can’t tell! It would be too much of a spoiler, but I can say it takes place in the same chapter where we visit the Sistine Chapel. 6) Did you have similar “aha!” moments to Shakespeare’s when he found the Macbeth story while you were researching? Of course! That moment was an actual “aha!” moment during my research, and there were more! I’d say the most serendipitous discovery was when I learned of Shakespeare’s involvement in the Earl of Essex rebellion, which plays a major role in the story due to its relevance to national security and espionage. However, I’d say the most shocking discovery came while researching chemical experiments for the cunning folk in the story. There’s a major scene in License to Quill when many readers–yourself included, I’d wager–will think that what they are reading is magic, but it’s not. It’s a chemical reaction no different than the ones used in classrooms today, which is how I found it in YouTube! 7) How long did it take you to do all the research and writing? I spent about six months doing nothing but research on the characters, situations, and political climate for the story. Once I knew these subjects well enough to write them with confidence, I did just that for the next six months, the whole time consulting sources I had previously categorized for details. Truth be told, I spent a lot more time researching the novel than writing it. One heavily footnoted page took me more than six months to research but only a few minutes to write. The book’s climax, meanwhile, was written in one wild, crazy evening–as was the case with its predecessor The Great Abraham Lincoln Pocket Watch Conspiracy, I should mention. It was an exhausting ordeal, but I believe it added to both stories. My characters were going without sleep to defeat their enemies, and I wanted to share in the experience to make it sound genuine. 8) Do you have plans to do another book like this? Without a doubt! I’m already working on a stand-alone sequel to License to Quill and have plans for a direct sequel to it as well. The same goes for The Great Abraham Lincoln Pocket Watch Conspiracy, which shares the same universe as License to Quill and which I always viewed as part of a large, grander narrative stretched across thousands of years. As long as people keep reading these books, blogging about them, and sharing them with their friends, I hope to keep adding to this narrative for as long as my powers allow me. With your help, we might get to see The Great Abraham Lincoln Pocket Watch Conspiracy and License to Quill made into graphic novels or even movies someday!